Mhm, I've not seen a "clicking" oakley fake so far! 24k ? That sounds even better ! I'm going to New York in may and was hoping you can give me a few tips/addresses, where a oakley-collector should go? Anything else (besides Oakley) is also appreciated! I don't like the Frogs nor do I like the Jupiter. When it comes to fashion shades I prefer squarey designs, like the Eyepatch and the Twitch. I can't wait to see the results ;)! Don't forget the Jawbone! Imo they are awesome and their lense-change-system is a nice innovation but I also do really like the XS. Well, I like how it looks on pics, I can't wait to try a pair. But so far it is a battle between the JB and the XS for me. It feels like it has been a few years since so much outstanding models have been released. Two years ago all we had to talk about were nice painted gascan frames... I'm really happy that this has changed! Whow, I missed a lot... the Square X looks great! Like the child of a Twitch and a Juliet... I'll need to try one soon! And that Spice Google... I was expecting a more aggressive design but it looks pretty nice, like a Stockholm for men. And I'm really happy that I don't like a lot of the new styles... that gascan derivate and that uber-expensive C6 with the (imho) boring design. When they were released, I bought a inmate and a felon right away because they look pretty awesome. Then I had to realize, that the felon looks really girly on my face - and my gf was really happy to get em and they suit her well. Since then I've thought the felon is a "unisex" declared girl model. Until know... Bong - the felon suits you awesome! That haircut is also nice... but however, these shades are made for your face. That rootbeer version looks awesome. But what I don't understand is why they've choosen Tungsten Iridium. 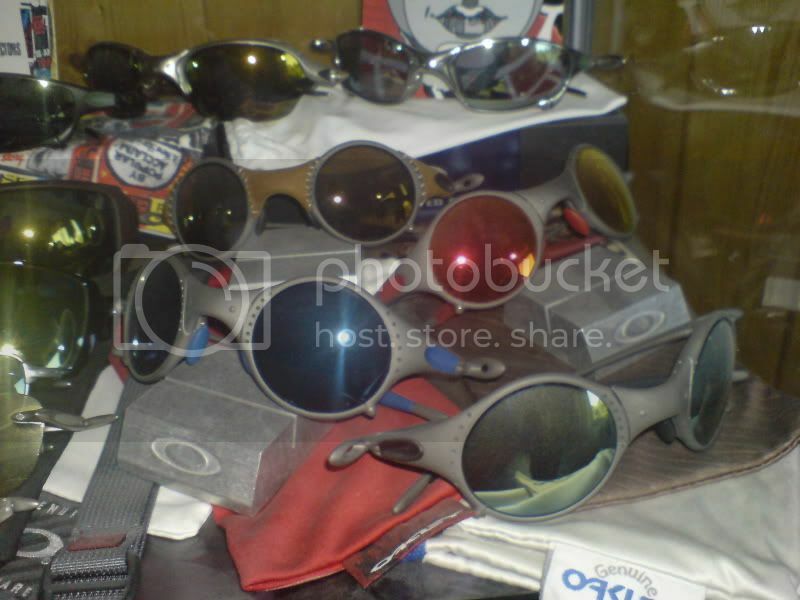 Hey - there are the big 3 Oakley classic Iridium lenses: Black Ir. (Pol. ), VR28 B.I. (Pol.) and Titanium Ir. (Pol.) - why do they put Tungsten in there instead of Titanium Ir.? Tungsten is just the weak sister of big ol' Titanium. J m 2c. I just saw a new footer! A small 3 person pic (with Dann, Phil and... sorry, I don't know). Congrats Dann, that line-up looks awesome! @Francois: The Ice Mars exists and it comes with a complete set of blue unobtanium. I still need to get the usual X-Metal/Black Ir. Do you know Dave Hill? On his side http://www.davehillphoto.com/ the lower row of pics, the fifth and sixth pic from the left show a kind of mexican wrestler with some nice gloves on. That pearl/purple looks crazy. Even if the "o" should be purple (I bet Josh is allready putting the paint/laque together). I tried to remember how VR28 Blue Ir. looks, but I think I've never seen in it rl before - does it really have a blue mirror like ice or more like G30 (or lenses with a g30 mirror)? Beside these two Razorblades I'm looking for.. Almost naked girls with Oakleys are underrepresented here. Thanks for starting the revolution Nick! Jet Black (/black)? Silver logo (/white)? It is a shame how they influence the prieces. I'm searching for stretchline Razorblades (to complete my Stretch collection..) and since these ******* offer them for over 200 USD the prices developed horrible. A MD-Thump? Mhm...imo not that far away from a jawbone-thump. There should really be a full framed sport-Thump. It's great to read all these reviews! @Terrorism: Yeah, these new controls on the Split Thump are really stylish ! And I thought Oakley should offer some speakers that you can attach to the ST instead of the earpieces. Put the Sunglasses down, attach the speakers and start the barbeque! When I first heard that Oakley is going to release some shades with a mp3-player included, I wasn't that impressed. The hardware of such a player isn't that much, I had allready seen earphones with an included mp3-player. That's why I skipped the first Thump when it got released... mainly because of the price. A year later, I shoot a matte black T1 on ebay for a pretty good price - actually I only bought it because of the price (I'm pretty sure most of you know that situation... buying Oakley stuff you don't need nor want just because of the price or because you stumbled over it). 3) I can't believe this model really suits someone. A few days later I used them the first time for cycling... and I understood what they are made for. Okay, it's dangerous to use a mp3 player on the bike - but it is even more dangerous if you have a cable coming down from your head. Next steps: Selling the T1, buying a brown smoke T2 with Gold Clear and Titanium Ir. lenses (a rep giveaway set...thanks ebay!). 2) the feeling - (partially: because of the flip-up lenses) they don't feel as sturdy as Oakleys usually feel, as I like them to be! The T2 is a awesome piece! 1) The gascan frame is kinda sporty, classy and suits almost everybody. 2) The earpieces are better (sound and adjustability) and the lense options are incredible (because of the massive success of the gascan). 3) Compared to the T1 they only loose in one category - the fit. The T1 fits like a glove, when you put them on they'll stay on their place until you put them away. 4) The T2 has unobtanium and the stems have a way better curvage than the usual gascan (esp. the first generations of gascans). I only wore them with music on and that way the earpieces fixed them so I had no problem with them at all. I used them for ca. 2-3 years almost every day on the bike. After a few months I sold the brown smoke piece and bought the polished black one with more storage (Blumentopf Edition). I also bought some lenses for every light condition - Titanium Ir. for the sunny days, G30 Titanium for cloudy days, Titanium Clear for the evening and H.I. Yellow for the night (if you ask me - with this lineup you don't need anything else!). Then, after a few years of heavy usage, the T2 stopped playing music. I think it is because I used fashion mp3-sunglasses for sports - f.e. while I was sweating or it was raining. I think the humidity killed it. Well, now I had to get a replacement. The Split thump was just released and the Thump Pro was out for a few months. I decided to go with the T Pro, because that Hijinx-design doesn't suit me, as a collector I don't need detachable earpieces and I thought the ST could share the same water-weakness as the T2. Now I have the Thump Pro (from a fellow OR member, thanks!) for a few months. 3) The new ear-pieces make it much easier to fit them in the Thump vault. 4) The shape (on my face, the "style") is okay - better than the T1 but not as good as the T2. I expected a bottlecap-Thump, but the TP makes kinda cat eyes (the lower edge of the lenses create a "V"). Beside that there's another disadvantage compared to the T2. 5) With the TP changing the lenses isn't that easy. After a few changes you know how to do it, but it still feels like trying to break the frame or at least the lenses (but we know that a usual human can't break a Oakley lense ;). Now that I've seen the jawbone-lense-change system I really hope they'll put a Jawbone-Thump out (or at least a Thump with such an easy lense-change-system). The sky and solstice are good looking cars, but that alpha alfa, is a work of art. I take a Zero L in Night Camo/G30 Black Iridium. I never tried one, so it is for me or just the final cutdown! Hey - G30 BI is pretty rare!